Are you looking for an outdoor blanket for picnics at the park, beach days, and local travel excursions? Stop using the fleece from your couch! Your in-home blankets clearly aren't designed for outdoor use and all you end up doing is bringing dirt, sand, and grass back into your home. In today's post I'm going to showcase a few top rated outdoor blankets that are built for the occasion in regards to their fabric, size, and functionality. First I'll teach you what to look for in an outdoor blanket and why not all blankets are created equal, and then I'll help you choose one by showcasing the top outdoor blankets on the market. Just here for my recommendations? Skip past everything and view my list of Top 9 Best Outdoor Picnic & Beach Blankets. Not all outdoor blankets are created equal and just being labeled and marketed as an “outdoor blanket” doesn't necessarily means it'll rise to the occasion. Here are the most important qualities to consider before making a purchase. The material of the fabric. Some fabrics are going to hold up better than others and are better suited for particular environments like the beach. Fabric is so important that the entire next section of this post is dedicated to choosing the right one. Size / dimensions of the blanket. The #1 complaint customers have about small outdoor blankets are that they are too small. That's why you've got to check the dimensions before you buy! There will probably be more than one person sharing the blanket along with other items you have with you like your bags, stereo, cooler, umbrella, etc, so take that into account before purchasing a tiny outdoor blanket that's made for two. Weight of the blanket. Two blankets with the exact same dimensions can weigh twice as much as the other. If you're going to be carrying your blanket on a hike along with other gear, every ounce counts. Are there pockets? Some blankets offer zippered compartments and can double as a small carrying bag. This dual function can save you from having to carry an extra bag for a few small items. Foldability. How compact does this blanket need to fold up? Will you be transporting it in your car for local excursions or hiking miles with it through the wilderness? How compact the blanket folds will make a difference in how much you enjoy using it. Is it machine washable? I'd imagine that you'd rather not dry clean your blanket or spot clean it by hand. There are plenty of machine washable blankets on the market so there's little reason to choose otherwise. What's the best fabric material for outdoor picnic and beach blankets? The blankets I'm profiling today are best for being used on a picnic, at the park, or on a beach. They are NOT designed for surviving extreme weather conditions or long camping trips. (You might be more interested in checking out extreme camping blankets if that's what you're looking for.) Therefore we don't need overly expensive extreme condition aeronautical fabric that NASA astronauts take with them to Mars. However, we do want a material that's suitable for the outdoors (ie: won't cling to dirt, sand, and grass), moisture wicking (so it doesn't become wet and soggy), durable (so it doesn't rip while in use if it gets tossed around or pulled in opposite directions), and long lasting (because who wants to buy a new blanket every year). Today we will be primarily looking at outdoor blankets made from POLYESTER and NYLON (or at least partly made). These are great materials for outdoor blankets because they're durable, lightweight, and still allows the blanket to be machine washable. Better outdoor blankets are made from two different grades of polyester so that the top is more comfortable for skin contact and the bottom is water resistant and more durable. Ultrasonic stitching is where the top and bottom fabrics of the blanket are fused together. This prevents slipping on the blanket which happens with cheaper blankets when the top and bottom aren't fused together and slide against each other. Those types of blankets are often bulkier too because air creates space between the two layers. Not all of the blankets on this list have ultrasonic stitching (it's a rare quality to find), so be sure to check my bullet points in the blanket reviews. Be careful of blankets that are advertised as waterproof. Read the reviews because not all of them are actually waterproof. Water resistant is a more accurate description – and that's fine for most people's needs. Waterproof should mean that if you placed the blanket in a large puddle, no water should ever seep through, but that's not the case with many outdoor blankets even though they say “waterproof”. For the most part, assume a blanket is just water resistant unless verified waterproof by user reviews. For your needs, water resistant is probably sufficient but don't let an advertisement of waterproof steer you toward one particular blanket unless verified by user reviews. Now let's get into our top picks. These particular outdoor blankets have been chosen for meeting most or all of our criteria above and for receiving positive reviews from validated purchasers. This is my friend Glen Mermer's company Yungger. Learning about his product and the attention to detail that goes into making a simple blanket is actually what inspired me to create this buyer guide. (View the rest of my Travel Buyer Guides.) Glenn has spent the better part of this past year researching the market for buyer pain points and testing existing outdoor blankets in order to come up with his own – which he feels is the best outdoor blanket on the market. He has two models available. 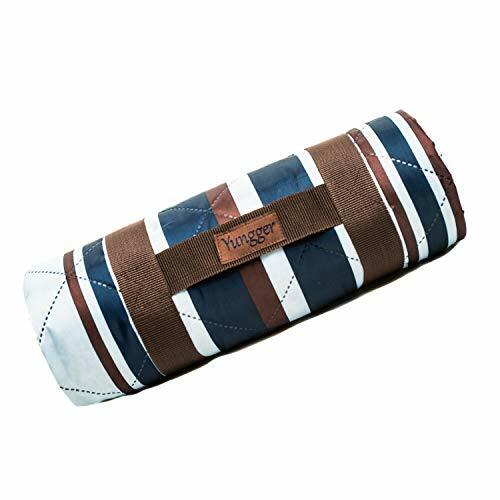 The first is the Yungger Outdoor Blanket with Zippered Pouch pictured above. This blanket is 100% machine washable because it's made from a high grade polyester with a water resistant bottom. It folds into a compact tote at 15″L x 11″W x 3.5″H secured by velcro straps and folds out to 79″ X 59″. This outdoor blanket is large but lightweight, weighing it at a mere 1.3 lbs (or about the weight of a loaf of bread). Two things really stand out with this Yungger blanket and separate it from the others on this list. The first is it's exterior zippered pouch for carrying items with you on the go. The second is its ultrasonic stitching, which as I mentioned earlier, is where the top and bottom fabrics of the blanket are fused together to prevent slippage which occurs on cheaper blankets when the top and bottom layers slide against each other. 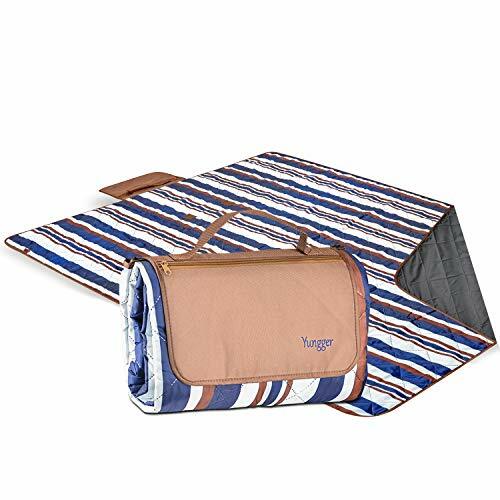 The next blanket on my list is Yungger's Outdoor Bullet Blanket, which boasts all the same features as the previous model (machine washable, ultrasonic stitching, lightweight, etc), except for the zippered pouch. With the Bullet model, you trade the zippered pocket for a more compact tote. This model folds into a 16″L x 6″W x 6″H bullet shape and folds out to 79″ X 59″ – same as the zippered model. The Bullet model works best for attaching to the straps of a larger book bag – similar to how you'd attach a sleeping bag when camping. Next up on my list is the Oceas Outdoor Waterproof Blanket – one of the few legitimately waterproof outdoor blankets I found with positive reviews that fits the other criteria on my list. On one side is a plush fleece which provides insulation in cold weather months (if you're brave enough to spend time outside, unlike me) and the other side is made from a waterproof polyester coated with polyurethane. 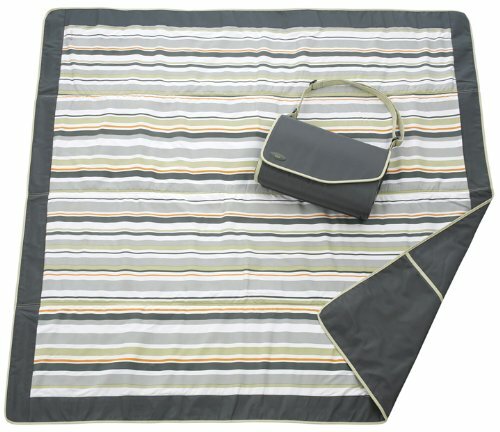 This blanket folds up tight via an attached belt and slides into a water resistant bag which is included in the box. And it's machine washable! Pouch: No, but you can slide small items into the bag with the blanket. Fourth on my list is the Practico Outdoors Picnic & Outdoors Blanket which is available in two color choices – red or navy blue plaid. It's large and water resistant (not waterproof) but a little heavier than the others on this list. It comes with a belt to wrap up the blanket when folded that can double as a handle. If you're looking for an outdoor blanket with a classic plaid design – you may like the Practico Outdoor blanket. Next up is the JJ Cole Grey/Green Outdoor Blanket which is a pioneer in the outdoor blanket space and boasts over 1200 positive reviews since 2008. 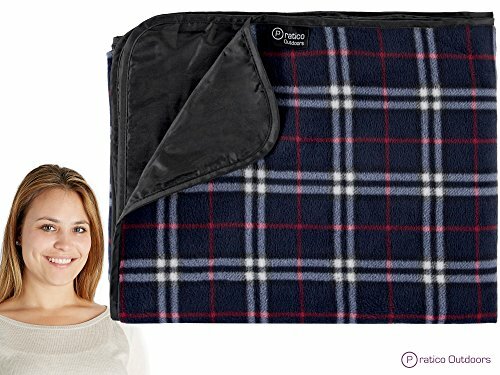 This 60″ x 60″ outdoor blanket folds into itself to create a stylish shoulder bag equipped with a detachable shoulder strap. It's available in 9 different color schemes – one being a watermelon design. It's also one of the only other blankets on this list to offer fused layers to prevent slipping. Ready for a HUGE outdoor blanket? The Wekabo Oversized Outdoor Blanket is the biggest one I'm featuring today at 120″ x 118″ and quite possibly the biggest on on the market. If you want bigger than this, you'll have to buy a parachute! It's big, but it's also lightweight, weighing in at less than 1 lb, and folds down to 6″ x 7″ into an attached storage blanket. It comes with metal stakes that attach to each corner to drive into the ground and keep the blanket down. In fact, it's so lightweight that you'll probably need to use those stakes on a windy day. Customers love the Wekabo Oversized Outdoor Blanket because it's so BIG! If you're trying to fit the whole family onto one blanket and don't mind a thinner design (ie: no padding), this one's a good pick. It's machine washable, doesn't cling to sand, water resistant, and fast drying. 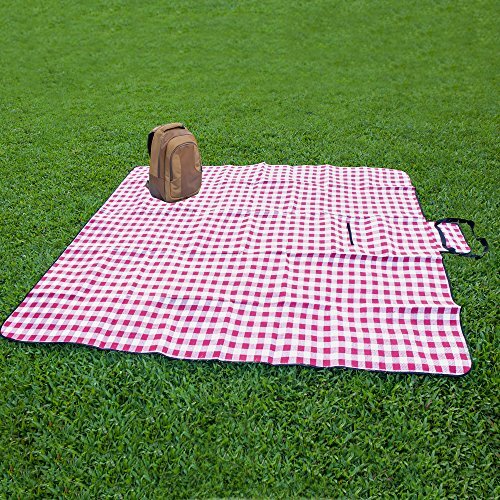 If you're looking for that classic picnic blanket, like the kind Dorothy would have in The Wizard of Oz, you'll appreciate the ZhongBan Extra Large Outdoor Blanket with its classic red and white checkered pattern design. (Also available in Blue and White checkered.) This outdoor blanket is fleece on the top and water resistant polyester on the bottom (although not the prettiest design on the bottom). It's mid-sized compared to the others on this list at 90″ x 80″ when folded out and weighs in at 1.3 lbs. LARGE OVERSIZED AREA - 55" x 70" blanket fits the whole family comfortably. If you'd rather a floral or vibrant design to relax in the garden with your kiddies, then the Roebury Picnic Blanket is a great choice, although a little smaller than some of the others on this list at 70″ x 55″. 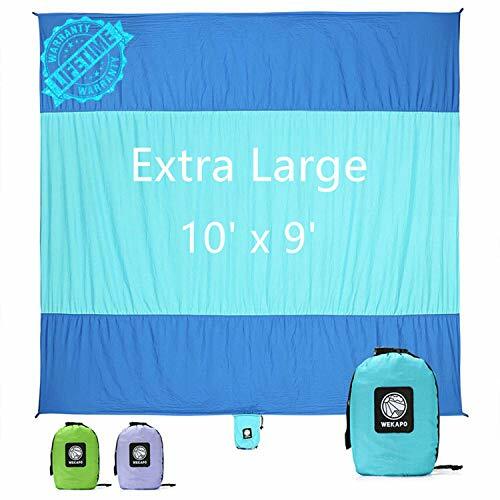 This outdoor blanket offers fuzed top and bottom layers so it's slip resistant for kids playing on it, is machine washable, made from polyester on both sides, and folds down into an attached tote with handle. 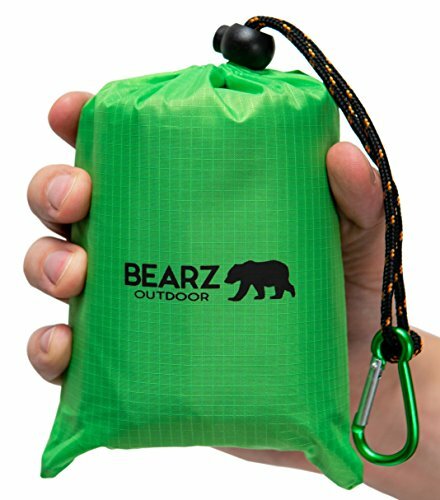 We've almost covered the full spectrum of sizes here today, so let's end small with the Bearz Compact Outdoor Blanket – a great pick for those looking for an outdoor blanket that fits in the palm of your hand. 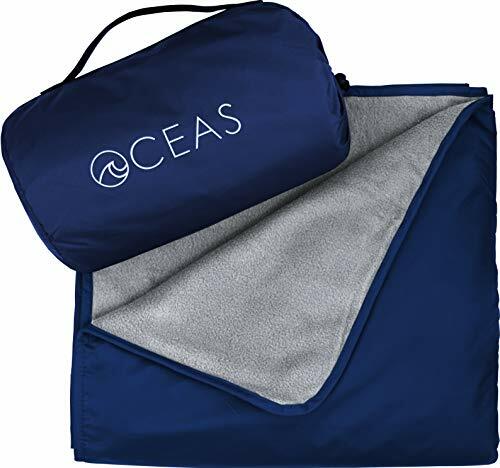 This 60″ x 55″ nylon outdoor blanket folds down into a 4.5″ x 3.5″ included nylon pouch with a handle and carabiner for easy attachment to your bookbag. 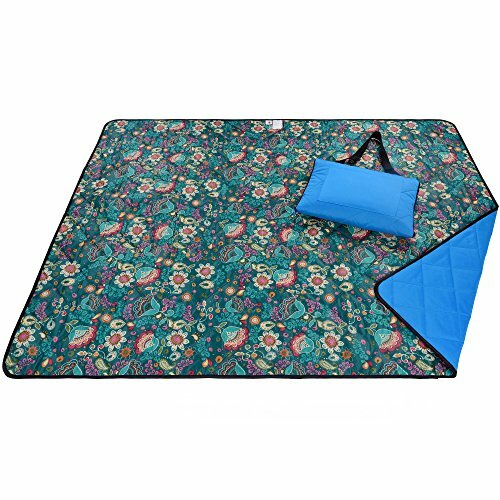 It's a great option if you'd like to have an outdoor blanket handy when you want it, without taking up too much space in your bag the rest of the time. Perfect for outdoor travelers like me who pack light. Which outdoor blanket did you choose? Drop a comment below and tell me which one from this list you went with, or alternatively, if you chose one not on the list. Let's keep this list growing! I hope that today's buyer guide will save you countless hours scrolling through the web and reading reviews so that you can spend more time enjoying the great outdoors on your brand new outdoor blanket. Love today's travel buyer guide and want to share it to your favorite travel or shopping boards? Use my special Pinterest friendly graphics below!